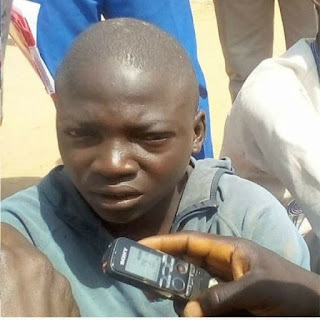 The men of Bauchi state police command have arrested a 17 year old boy identified as Nuhu Bulus of Boloji ward, Toro local government area of Bauchi state who killed his 65-year-old father, Bulus Azi. The boy was arraigned by the police alongside other suspects. According to police reports, the boy killed the father by hitting him with a mud pot, wood and Sickle. It was gathered that the suspect’s other siblings, Samaila Bulus and Musa Bulus‎ reported the incidence at Toro police station on January 17th, 2018. They reported that they left their brother with the father and returned to find their father with head injuries allegedly inflicted on him by their brother. The father was later rushed to Toro General Hospital where he was certified dead by a medical doctor and the suspect was later arrested. Speaking to journalists after their arraignment, Nuhu Bulus confessed that they had an argument with his father which later degenerated and he hit the father several times on the head with various objects. He also admitted that he committed the act under the influence of hard drugs which he had taken. The suspect will be charged to court after investigation.